Please click here, register, and pay the class here and then we will schedule the class time with you. Is the course required by the State? Yes. 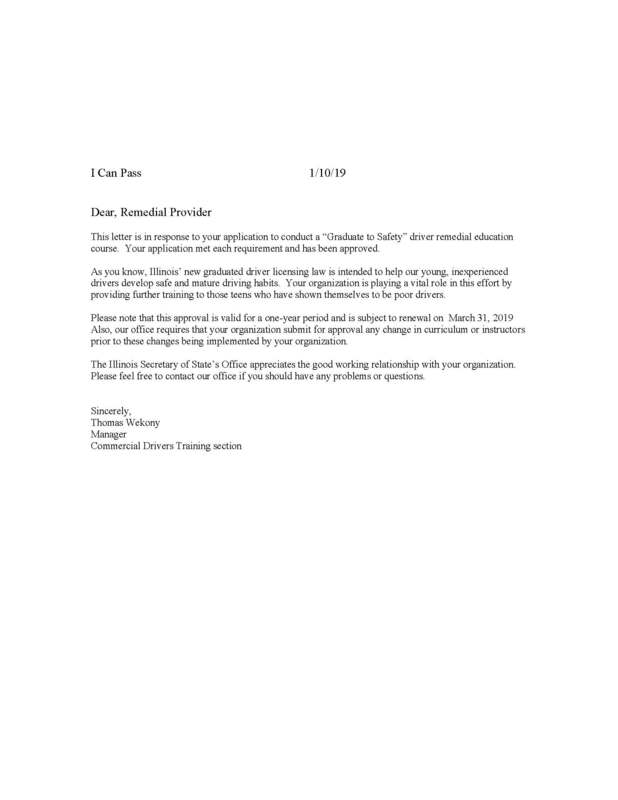 Drivers between the ages of 15 and 24 who have received two violations within 24 months or who received a citation under the Zero Tolerance Law are required by the State of Illinois to complete the Graduate to Safety Driver Remedial Education Course. Or, if you got a ticket and plan to remove the record, the corresponding court may require you to take this course. The course is approved by the State of Illinois to fulfill this requirement (see approval letter below). Am I required to take the course? If you are required to take the course, you should receive a letter notification from the Secretary of State Driver Services Department. It is a very interactive course between students and the teacher, including contents: Altitude and Behavior Modification, Rules of Road, and Handling Social Pressure. The cost is $80. We are not responsible for drivers taking the incorrect class. When will the course be taught? It will be during night time or during weekends. Where will it be taught? It will be at 10 Henson Pl., Suite #3, Champaign, IL61820. Can I take anyone to the class? No, it is not allowed. But if you need a legal driver to drive you there, he/she may wait in other rooms.